WASHINGTON, D.C. -- Americans' satisfaction with the way things are going in the U.S. averaged 27% for the second consecutive year. Satisfaction remains higher than it was from 2008 to 2014 but is still far below levels from the mid-1990s through the mid-2000s. Gallup's latest monthly update on satisfaction, from a Dec. 4-11 poll, is 29%. Throughout 2017, satisfaction ranged from a low of 21% in October -- after the Las Vegas massacre -- to a high of 32% in April. 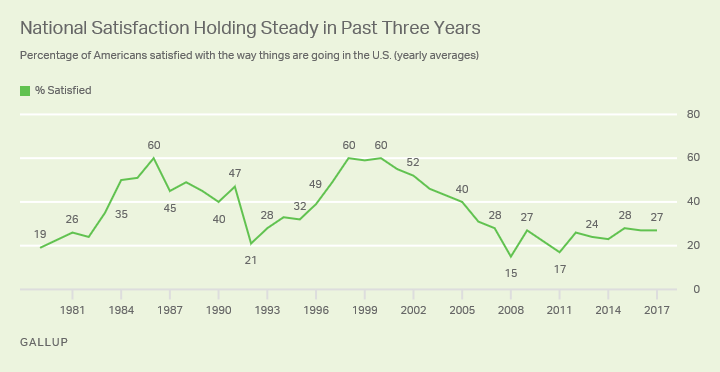 Americans' satisfaction with the country has averaged 37% across the nearly four decades Gallup has asked this question, beginning in 1979. However, satisfaction has consistently been below that historical average since 2006. The high points in satisfaction on an annual basis were in 1986, 1998 and 2000, all years when the U.S. economy was strong. The years with the lowest satisfaction levels -- 1979, 1992, 2008 and 2011 -- were years of relatively weak economies. 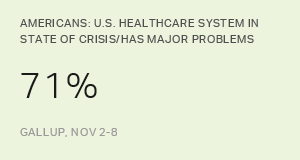 Satisfaction was lowest in 2008, averaging 15%, which included the record-low individual measurement of 7% in October 2008 in the midst of the financial crisis. In contrast to the relationship between the economy and these earlier high and low points, a strong economy this year has not done much to make Americans feel better about the state of the nation. Their dissatisfaction with government in general and with President Donald Trump in particular may be weighing more on their minds than the economy when assessing the state of the nation. The stability in satisfaction among all Americans in 2017 obscures significant shifts by political party after the change from a Democratic to a Republican presidential administration this year. On average in 2017, 46% of Republicans, 25% of independents and 13% of Democrats were satisfied. That is a near mirror image of 2016, when 43% of Democrats, 26% of independents and 12% of Republicans were satisfied. 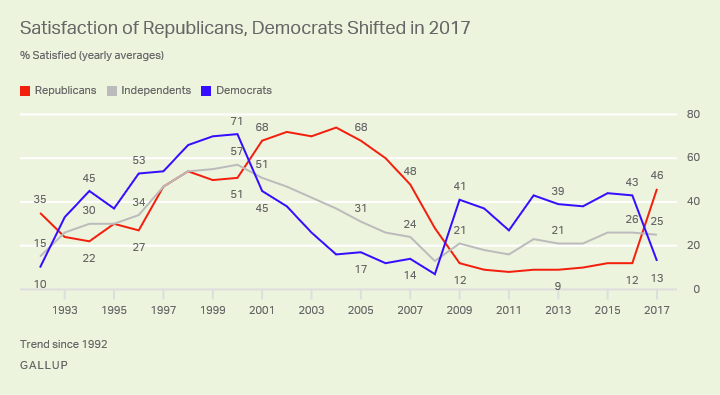 There were similar partisan shifts when the party of the president changed in 1993, 2001 and 2009. Supporters of the incumbent president's party have mostly had satisfaction levels averaging around 40% in recent years, while satisfaction among supporters of the opposition party has generally been closer to 10%. Independents' satisfaction has fallen in between, generally averaging between 20% and 25%. Neither party has had an annual satisfaction score above 50% since 2006, when Republicans averaged 60%. However, Republican satisfaction exceeded 50% in several months this year -- including the current 52%, up from 44% in November after the Republican-led House and Senate each passed tax reform bills. A new presidential administration has done little to boost Americans' satisfaction with the state of the nation this year. In fact, satisfaction is essentially the same as it was the past two years, although Republicans are now much more pleased with the direction of the country while Democrats are highly dissatisfied, reversing the pattern seen during Barack Obama's administration. Satisfaction levels have improved from their low point in 2008, but they remain significantly below the historical average of 37%. It has been more than a decade now that satisfaction has been below average. 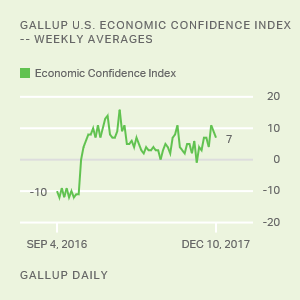 An improving economy and greater economic confidence -- factors that in the past were associated with higher satisfaction -- have done little to change Americans' perspective on the situation in the U.S. this year.